Christmas and New Year were enjoyably spent in England at a very happy family gathering but now back in my beloved Algarve, I was eager to return to the countryside. Where better to start my 2017 activities than on the Ria Formosa just east of Tavira town? 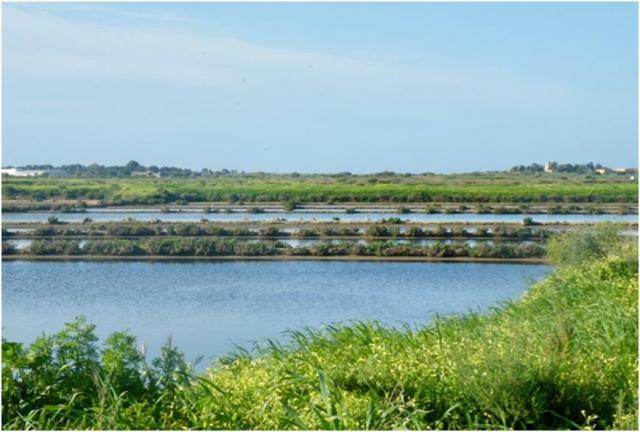 This area mostly comprises working and abandoned salinas (salt pans) but parts are still sapal (saltmarsh) and along the Canal de Tavira (Tavira Channel) there is an attractive stretch of sandy shoreline. The inland edge used to be compatible farmland but sterile, plastic greenhouses have replaced much of this. Workers now don protective clothing and facemasks. Ignore the greenhouses as this is still a splendid area to visit. The popular Ecovia Litoral Cycle Route passes through and provides good access. A fairly late start for my walk meant that on this beautiful morning people were everywhere. This is a reserve in name only. 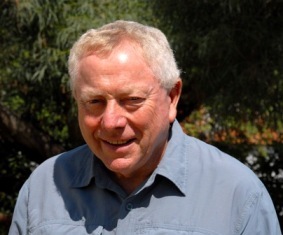 There are no signs restricting access to the more environmentally sensitive areas. Walkers, with and without loose dogs, cyclists, joggers and even birdwatchers penetrate the most distant parts. And today, even off-road vehicles were exploring usually impassable tracks. Three young ladies were climbing and sliding down a huge salt mound. How long before the salinas’ operators say that enough is enough? There are no information boards for visitors explaining that specialist birds such as Black-winged Stilts, Avocets, Common Redshanks, Kentish Plovers and Stone-curlews breed there. Despite a touch of grumpiness, I got off to a very good start. I telescoped what I expected to be a distant swathe of Paperwhite Narcissus Narcissus papyraceus but to my surprise the flowers had yellow coronas. I later identified them as Polyanthus Narcissus N. tazetta – a stunning species new to me. 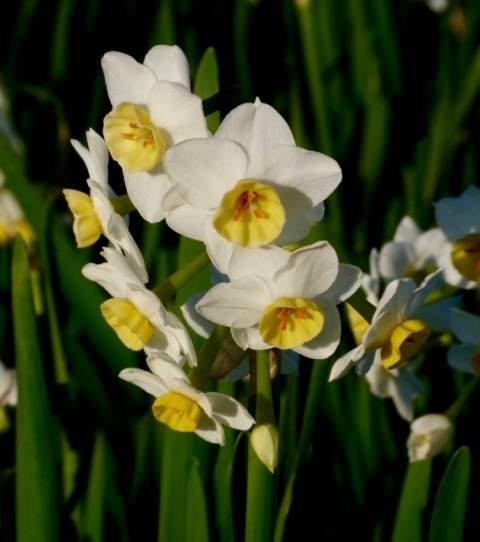 This narcissus is native to the Mediterranean Basin and apart from being a popular garden plant is grown commercially for its essential oil, which has proven antiviral properties used especially for combating influenza. 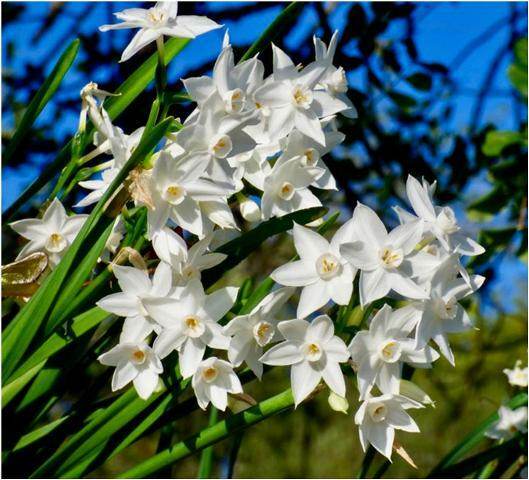 Paperwhite Narcissus is the commonly seen white narcissus, which is in flower along road verges throughout the Algarve during January. Although lovely, don’t be tempted to pick a bunch as once indoors its fragrance is intense and overpowering. Another white narcissus is Late Narcissus N. serotinus and this is in flower at the end of autumn, when little else is in bloom. Interestingly, I have only found it, like today’s Polyanthus Narcissus, growing on what must be partly saline soil. And what of the rest of my walk on this pleasant morning? Apart from a high count of twenty Common Shelduck, two Common Snipe feeding in the open and a few uncommon Slender-billed Gulls, birds were much as expected. Just three Stone-curlews was worrying - they used to breed on the farmland and in midwinter I would normally have seen a flock of a hundred or so. 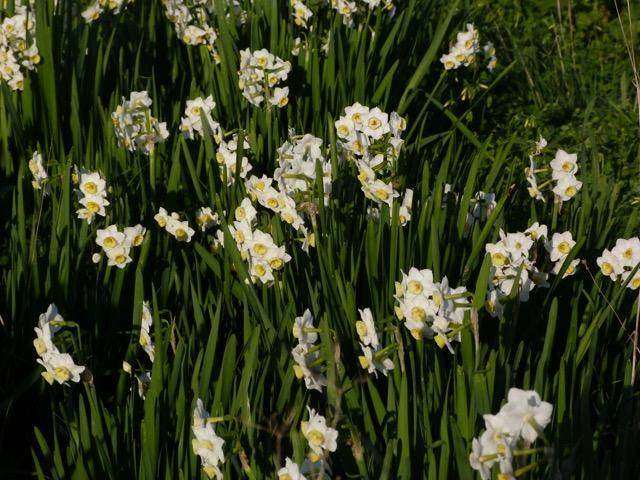 Nevertheless, just to be out again in the sunshine was great and those narcissi were stunning.